If you need to submit medical documentation to take sick leave, that should be written in your company's time-off policy. At any point, you or your immediate family could fall ill. If your employer provides sick leave, it’s reassuring to know that you can take time off and your job will be safe. The number of sick days you’re entitled to varies by employer. Some employers create separate policies for salaried and hourly employees. Others base their policy on whether employees are full-time or part-time. Salaried employees are usually classified as exempt under the Fair Labor Standards Act (FLSA) and are typically executive, administrative or professional staff. Because of their status, they might get more sick time than hourly, or non-exempt, employees. They might accrue a specific amount of sick time during the calendar year, such as six days, or they may accrue based on hours worked. In the latter case, sick time accrues according to whether they work full-time or part-time hours. Salaried, exempt employees must receive their full salary each pay period to receive sick time unless a permissible deduction applies under the FLSA. If you’re salaried exempt, your employer can dock your salary for overuse of sick days. Hourly employees are typically classified as non-exempt under the FLSA. Sick policies for hourly employees are based on time worked. For example, they may accrue 3.7 hours of sick time based on working 80 hours each biweekly pay period. In some companies, all employees accrue sick pay at the same rate whether they’re full-time or part-time, salaried or hourly. In other cases, sick leave for part-time employees is prorated based on their hours worked. Generally, employees must work for the company for a certain time, such as six months, before they can take sick leave or until they have accrued a full day of sick leave. Salaried, exempt employees might accrue sick time at a greater rate than non-exempt employees, especially if they must work long hours for their agreed-upon salary. Under the Family Medical Leave Act (FMLA), certain salaried and hourly employees are entitled to unpaid, job-protected sick leave of up to 12 work weeks. You must have worked for your employer for at least 12 months, consecutive or not, and for 1,250 hours during the 12 months prior to the start of your leave. Your employer must have 50 or more employees and your reason for taking the leave must meet FMLA conditions. FMLA leave is valid for the birth or adoption of a child, to care for an immediate family member who is seriously ill, or to recuperate from a serious illness or injury. The state may have family and medical leave laws that provide greater protection than federal law. 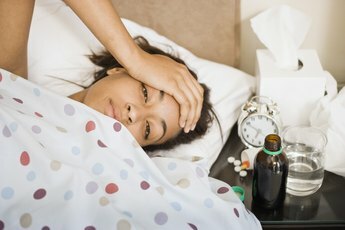 If your employer chooses to provide sick days, the state may have specific recommendations and rules on how the policy should be maintained. For example, the policy might need to say whether full-time or part-time employees are eligible for sick leave, the rate of leave accrual, eligibility rules, whether leave is carried over into the next year and how sick leave is handled when employees leave the company. The state might decide that vested, paid time-off cannot be forfeited. In this case, an employer can cap the number of sick days an employee can accrue from year to year. However, if the employee leaves the company, her employer must pay out her unused time-off, including sick days.